“We want to ensure there are no pending refunds in the system,” a senior finance ministry official said, adding that the idea is to clean up. NEW DELHI: For many years, muted revenue collections meant delayed or no tax refunds for India Inc., especially exporters. Facing a revenue shortfall in the first half of every financial year, North Block would issue an unwritten instruction to field officials to hold back refunds. This year, there will be a break from the past, with a directive going out to the field to release all refunds amid preparations to start on a clean slate for the goods and services tax, which the government hopes to implement from April 1, 2016. The Central Board of Excise and Customs, the apex indirect taxes body, is also working on a comprehensive overhaul of the refund mechanism for the BPO, IT and ITES sectors. “We want to ensure there are no pending refunds in the system,” a senior finance ministryofficial said, adding that the idea is to clean up before the GST is implemented, taking advantage of healthy indirect taxes revenue. Indirect tax collections increased 35.8% to Rs 3.24 lakh crore in the first six months of the current financial year, more than 50% of the budgeted estimate. The government has projected collections of Rs 6.47 lakh crore from indirect taxes in 2015-16, a growth of 18.8% over the previous financial year. 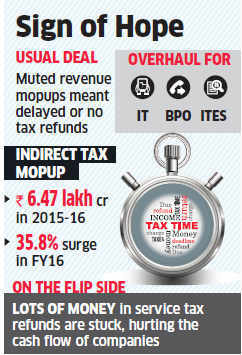 The buoyant tax collections have given the finance ministry room to clean up the refund process. The Narendra Modi-led government has promised a conducive environment for businesses and a fair and stable tax regime, the official said, adding that holding back refunds was not in keeping with that spirit. Apart from cleaning up the mechanism for duty drawbacks for exporters, the CBEC will issue a directive to speed up refunds of service tax to the BPO, IT and ITES sectors, which continue to be delayed even after several clarifications were issued. “The directive would address key issues leading to delay of refunds,” the official said. Thousands of crores of rupees in service tax refunds are stuck, hurting the cash flow of companies that are already faced with challenges of growth due to the slow pickup in the key target markets of the US and Europe. Going slow on refunds helps inflate collections in a financial year as payment of the money due is pushed to the following year. Exporters can claim refunds on duties paid on imported inputs used to manufacture goods. Though no formal instruction is issued for delaying refunds, the IT portal for drawbacks usually develops glitches in the last four-five months of the financial year. Industry officials said the move to expedite refunds would help improve cash flows. “Very encouraging move…This would aid liquidity for exporters and thereby their business,” said Ajay Sahai, Director General and CEO of the Federation of Indian Export Organisations. The finance ministry’s directive is welcome. India does not export its taxes as it renders products made here uncompetitive in external markets. This is true for any country. So, exporters are reimbursed central taxes paid on inputs. Delay in refunds is sheer bad practice and hurts exporters. The hassle will end when the government adopts GST. Exports would become zero-rated — the final product or service will be spared tax, and taxes paid on all inputs refunded — under GST. So to start with a clean slate before the GST roll-out makes sense.